Habitat: Hyssop is native to the southern parts of Europe, mainly Mediterranean region. The plant prefers well-drained, rocky, limestone rich soils. 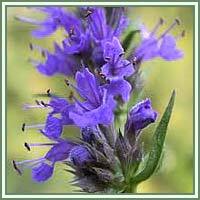 Description: Hyssop is an evergreen perennial shrub. It grows up to 60 centimeters in height. It has a slender, stiff stem and long and thin, sharp-pointed leaves, oppositely arranged on the stem. Spikes of small bluish-purple flowers bloom from late summer to late fall. Useful components: Flavonoids, hyssopin, tannins, terpenes, resin, volatile oil. Medicinal use: Hyssop is considered to have anti-viral, antiseptic, diaphoretic, expectorant and stimulant properties. It is very useful in treatment of various respiratory disorders. It can help reduce the sore throat inflammations and chronic catarrh. It is also a useful remedy against bronchitis and asthma. It can also be used in treatment of stomach complaints - chronic indigestion, excessive gas, abdominal bloating and colic. Used externally, in form of an ointment or poultice, Hyssop can be helpful in cases of cuts, cold sores, scars, bruises and herpes sores. Safety: Some herbs could react with certain medication. Therefore it is advisable to contact your doctor or herbalist before consumption of any herb.